I'm not certain how the tuxedo rental process works. Can you describe the steps involved? The tuxedo rental process is very easy. Click below to learn more about the general steps involved. However, if you have more specific questions, contact your nearest Jim's Formal Wear Retailer for answers to any aspect our tuxedo rental program. My groomsmen are located all throughout the country. How do I collect their measurements and get the information to my chosen Jim's Formal Wear Retailer? You can solve this problem by downloading the Out-of-Town Groomsmen Measurement Form. Use the form as a tool to collect the tux measurements for the gentlemen in your wedding who are too far from your chosen Jim's Formal Wear Retailer to be measured. Do you have offer any specials or promotions? Yes! We do offer special offers and promotions. However, since each of our retailers is independently owned and operated, they set their own pricing and promotions based on their market conditions. Contact your nearest Jim's Retailer for details. Can I measure myself for a tuxedo rental? 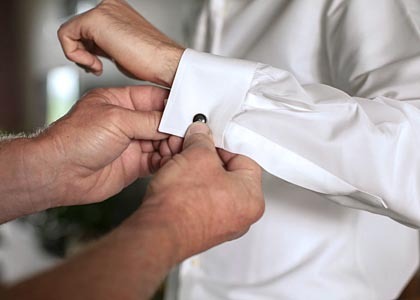 It may seem really simple to measure yourself for a tuxedo, but it's important to remember that it's next to impossible to acquire accurate measurements. Luckily, our measurement form is here to help. When will my tuxedo rental arrive in the retailer's store? We will deliver or ship your order to arrive a few days prior to your event. You can check with your local Jim's Retailer for a more definite answer on when they generally receive tuxedo shipments during the week. Continue reading to learn more about our rental process. I just tried on my tuxedo and certain items don't fit. Now what? Your local Jim's Retailer will be able to handle any last minute alterations or replacements at the time of your final fitting in store. When should I return my tuxedo rental? Your Jim's Formal Wear Retailer will expect your tuxedo to be returned on the first business day following the event. Can I return my tuxedo to a different location than where I rented it? Each of our retailers is independently owned and operated, so you'll need to return the tuxedo to the same location as where you originally placed your order. What are the differences between Traditional, Modern and Slim Fit tuxedos? What are the most common lapel styles available with tuxedos? Do you have tuxedos for little boys? Yes, we do carry tuxedos and formal accessories for little boys! We have a wide variety of styles and sizes. I'm not accustomed to wearing a tuxedo. Do you have any fitting tips to help me? 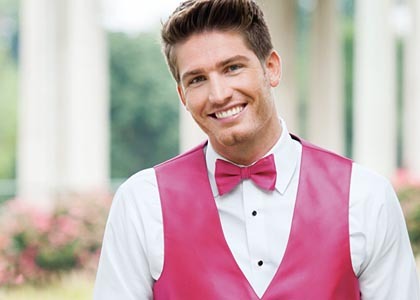 You can count on your Jim's Formal Wear Retailer to ensure that your tuxedo fits properly before you leave their store. However, here are the answers to some fitting questions we commonly receive. How do I fold my pocket square? We have an informative video showing you five different methods to fold a pocket square! I'm trying to match a specific color dress. Do you offer fabric swatches of your accessories? You can order a pocket square directly from us. Because fabric swatch cards are vary in accuracy, we want you to know you're getting the perfect accessory color.